For many years, scientists have been looking for an effective and efficient way to turn water into energy-storing fuels using solar- and wind-powered electricity, likely by splitting water into hydrogen and oxygen. To do this, they have been searching for catalysts to make these water-splitting reactions happen. Researchers have known for some time that oxides of many metals, including the familiar iron oxide called rust, are able to function as water-splitting catalysts, particularly when the atoms of the metal oxides are organized into small clusters. However, the activity of these clusters, or domains, can vary tremendously depending on their structures. In a new study of a related group of cobalt oxides, scientists at the U.S. Department of Energy's (DOE) Argonne National Laboratory sought to determine why two similar catalysts with somewhat different domain sizes behaved differently. 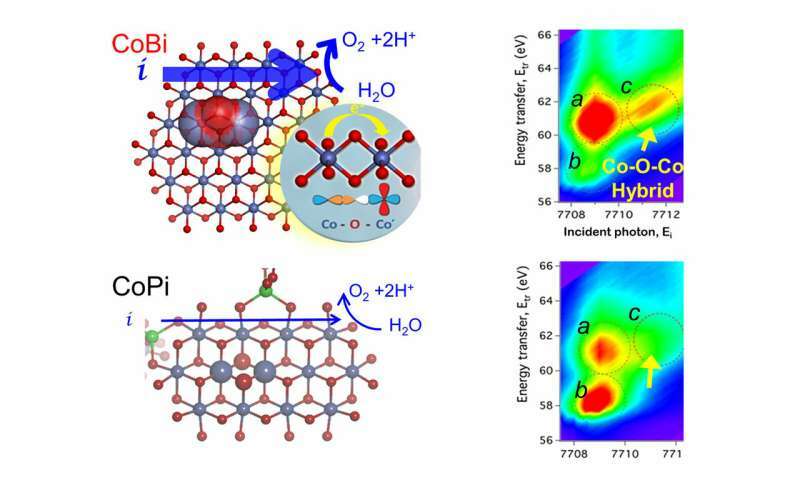 "Our research team really wanted to understand why cobalt oxides that can be controlled to differ only in terms of their domain structure have such different water-splitting activities," said chemist David Tiede, Distinguished Fellow in Argonne's Chemical Sciences and Engineering division. "Understanding this would provide a way to comprehend water-splitting catalysis for metal oxides more generally." In the study, Tiede and his colleagues utilized Argonne's Advanced Photon Source (APS) and Center for Nanoscale Materials (CNM), along with SLAC National Accelerator Laboratory's Stanford Synchrotron Radiation Lightsource (SSRL), all DOE Office of Science User Facilities. They combined a wide range of different X-ray techniques and CNM's electron microscopy capabilities to examine these domains at the atomic scale. "The exciting thing about this research is that we've taken a truly multimodal approach that combines the power of soft and hard X-rays," Tiede said. Tiede and other researchers presented a paper on the study in the Journal of the American Chemical Society, this past summer. "Resonant X-ray techniques are a powerful tool to provide a wealth of structure and electronic information on metal oxide catalysts, particularly when they are structurally ill-defined," added Argonne X-ray physicist Jung Ho Kim, who was among those authors. The research team was able to show that the differences in catalytic activity are controlled by conductivity at the atomic scale. When the cobalt oxide domains formed in the presence of borate, the researchers saw that electrons moved relatively quickly and smoothly throughout the material. When the cobalt oxides formed with phosphate, however, electric charges couldn't migrate as easily. The reason for this difference, Tiede explained, is that the cobalt atoms in the cobalt borate can share electrons with each other in what scientists call hybrid orbitals. "Essentially, you can think of the hybrid orbitals in cobalt borate as being like internet social media, whereas the orbitals in cobalt phosphate are like landline telephones," Tiede said. "Information can travel more quickly through always-on networked connections." The presence of the hybrid orbitals in cobalt borate makes the material a better water-splitting catalyst than cobalt phosphate, even though the latter has more active catalytic sites. "Being able to move the charges to the active sites becomes the key factor in determining the efficiency of the catalyst," Tiede said. In examining the two cobalt oxides, Tiede and his team found something else surprising. Typically, the water-splitting process requires bond-breaking and bond-creating steps that are the most challenging parts of catalysis, but in this case, getting enough charge to the active sites turned out to be the most difficult part. "Getting charges to the sites quickly enough is a key design parameter that we need to learn how to control," Tiede said. Combining charge mobility with water-splitting efficiency will be essential for developing a catalyst that can effectively turn water into electricity. "You can have the world's greatest air conditioner, but if the wiring in your house is terrible, you're not going to get it to work properly," Tiede added. "The water-splitting site is doing a lot of complicated things, but if it's not getting enough current, it's not going to do very much." The paper based on the study, "Resolution of electronic and structural factors underlying oxygen-evolving performance in amorphous cobalt oxide catalysts," appeared in the July 20 issue of the Journal of the American Chemical Society.